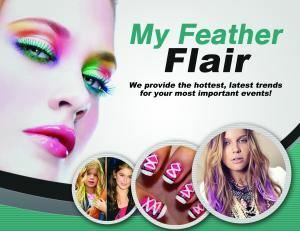 WE PROVIDE THE HOTTEST, LATEST TRENDS FOR YOUR MOST IMPORTANT EVENTS. CLIENT CUSTOMIZED, RELIABLE TALENT, A VARIETY OF SERVICES: FEATHER FLAIR, WILD HAIR COLORS, STACHES, FLOWER CROWNS, MEMORY BOOKS, PARTY LASHES, ETC... We offer "out of the box", sophisticated, creative and reliable talent for your special events and occasions. Whether you are planning an upcoming bar/bat mitzvah, birthday, holiday party, shower, carnival/festival, red carpet event, school function, or any other type of event, be it large or small, we can provide a variety of services that will convey an extra special touch to your guests. Everything is at your fingertips and completely customized for your individual needs.